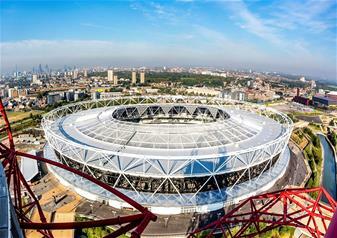 The London Stadium (former Olympic Stadium) in Queen Elizabeth Olympic Park is open for visitors to take a behind the scenes tour. The much loved destination has now been transformed into a superb multi-use venue. Visitors will have the exclusive opportunity to put themselves in the shoes of their heroes as they stand pitch side where superstars won gold and where West Ham’s players now play their home matches. With exclusive access to usually private areas of the venue, superstar footage and unique interviews, the new London Stadium tours are perfect for London 2012 enthusiasts, West Ham United supporters and anyone simply interested in understanding the workings of a world-class stadium. Visitors will be able to put themselves in the shoes of the Super Saturday athletes as they made their preparations on the warm up track before the roar of the crowds spurred them on to gold. And fans of the Stadium’s newest residents, West Ham United, will not be left disappointed as they follow in the footsteps of their heroes and make the walk along the players’ tunnel, out to the manager’s dug-out before standing pitch side at the iconic venue where they can imagine they are being serenaded by a deafening rendition of ‘Bubbles’ by 54,000 fans. The Stadium will come alive through a 75 minute interactive multimedia tour that has been specially developed for the Stadium. Every visitor will have a personal hand held device on this part guided, part multimedia tour. The device will show interactive content on the journey through the venue showing interviews with footballers and athletes as well as highlights from the history of the Stadium, UK Athletics and West Ham United. And once the tour experience is finished, head into Queen Elizabeth Olympic Park to enjoy the beautiful parklands and serene waterways all set within the shadows of the world-famous London 2012 Games venues. Tours start from the Ticket Office on the upper level of the Stadium Store.